Discussion in 'Movies, Plays, and Documentaries about Scientology' started by CommunicatorIC, Dec 3, 2016. Gaslight Theatre .. how apt. 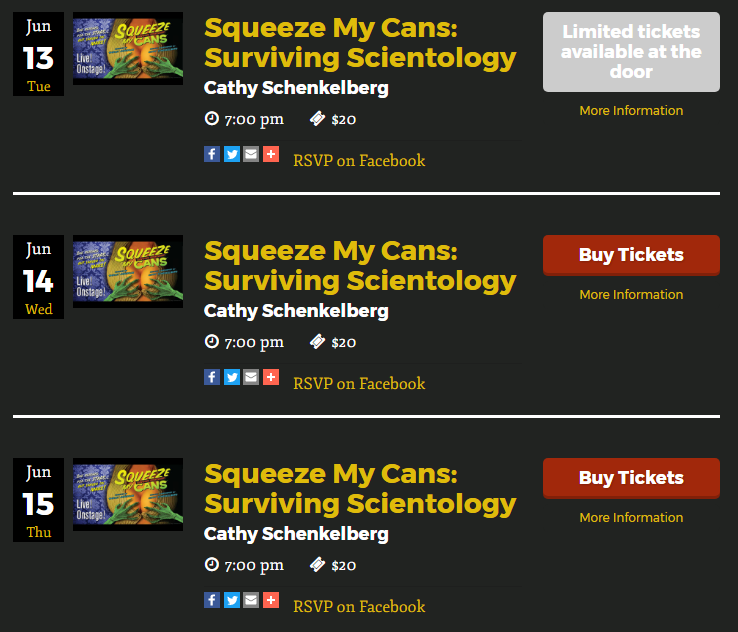 June 13-15, 2017: Squeeze My Cans one-woman show about Scientology at Reverb Lounge, Omaha, NE. The Church of $cientology had actress Cathy Schenkelberg for 14 years of her young, adult life. It took another 5 years for her to escape in the face of harassing phone calls, midnight knocks on her door by “outreach” staffers, an expensive custody battle and social rejection. In her original solo show Squeeze My Cans, Cathy shares a glimpse behind the velvet curtain of this strangely hilarious and unbelievably horrifying story of loss, isolation, manipulation and the relentless power of survival through persistance and humor. Yes, the title is also an edgy double-meaning. The show’s poster is a drawing of female cleavage and a low-cut dress — Schenkelberg’s jab at Scientology. She will perform Tuesday through Thursday at 7 p.m. at the Reverb Lounge, 6121 Military Ave., $20 per ticket (Tuesday is sold out); and at 7 p.m. on Friday and Saturday at Roncalli, 6401 Sorensen Parkway, $25. Roncalli spokeswoman Maureen Irish said the school is happy to welcome Cathy back and is pleased she will donate $10 of each ticket price to the school. Attendees must be at least 18, Irish said, and the provocative poster was deemed inappropriate for a Catholic school. Nearly a year after my first interview with Cathy Schenkelberg, she returns to update us on the evolution of Squeeze My Cans heading into a special benefit and a tour stop in Edinburgh!! Did she really add a musical element? Do people devalue one's pain over another based on experiences? Did Cathy ever get the Alien Sperm she needs for her new show?! Find out the answers to these questions and more on Come Get Sum Extra!!! Also, Ex Top Scientologist turned Critic turned Critic of something he invented called the "Anti Scientology Cult" turned David Miscavige Puppet Marty Rathbun has been shredding his former friends with lies and hateful indifference to their various horrific experiences in a series of boring cringe worthy videos. For the first time ever and without a net nor any personal knowledge of the man, I'll let my feelings on this fly uncensored with a special message for Marty! Why am I of all people mad at this stranger? What message could I possibly have for him? and How far will I go? Will I stoop as low as Scientology hate speech? Will I name call and give them ammo? Here's a hint: I don't give a F**k!!! Should be fun right!? 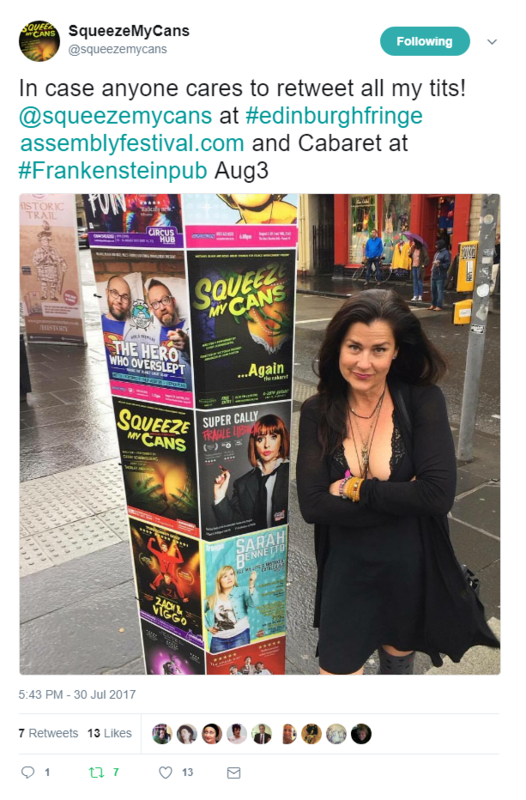 Cathy Schenkelberg's Squeeze My Cans show about Scientology at the Edinburgh Fringe Festival. I'm confident Cathy would appreciate retweets, quotations and replies.